There is an aura around Wall Street and the stock market that involves a lot of money. Most people are vaguely acquainted with the stock market and only understand that there’s a lot of money involved. Some of us in recent years have even begun to dislike everyone associated with the stock market because they have all the money that we are supposed to have. If you can beat them join them right? As I continue to get more and more questions about day trading I plan on explaining a bit more on what day trading is and how I make a living doing it. 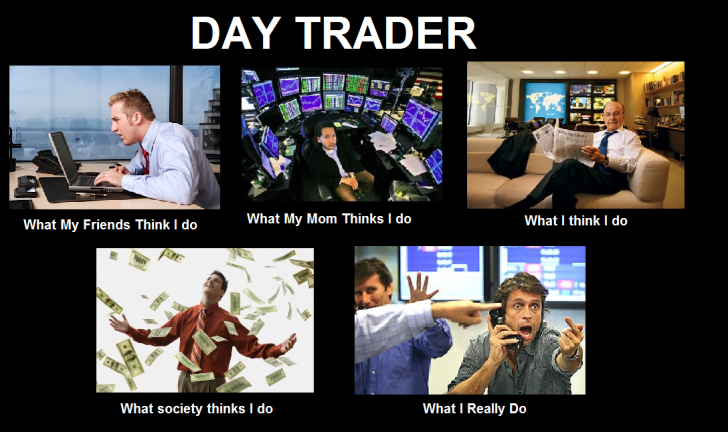 What Day Traders Really Do…. The financial system is significantly more complex than it used to be even 10 or 20 years ago. The basic premise behind why the stock market exists is because companies need money to grow. After a company gets to a certain point they need more money to grow. A private company turns into a public company and that is when a company first appears in the stock market. The stock market can be compared to eBay. EBay is the 21st century version of a garage sale, we have things we don’t need that still have value and we want money for them. The stock market is essentially the same thing but with companies that need capital (money) to continue growing. Eventually a company gets so large that they stop lending money from their friends, local banks, and family. They go public to receive a cash infusion they need to keep growing and compete in their industry. Once a person initially invests in a company via stock market we become part owners of the company. Stock markets deal in shares of stock. If there are 100 shares of Google and I buy one share I therefore own 1% of Google. This is relative because there are actually millions of shares of stock for certain companies. Every company is placed in a group of stocks called stock indexes much like categories on eBay. If we want to purchase a camera or laptop we will look in the electronics section. When one wants to purchase a new bed we look in the furniture section. Categories on eBay vary a bit to stock indexes but to the untrained eye we can look at it the same way. The NASDAQ composite index for example is mostly known for having technology stocks. The S&P 500 index is an index of the 500 largest public companies in the United States. So once a company goes from private to public we begin to invest in it. The left over shares have value and the general public decides what that value is based on the stock market. With anything that has value one can determine a future value. This is the reason why the stock market exists and the fundamental way that professional day traders really make money in the stock market. They buy and sell stocks based on their future value. In order to determine the value of a stock or company traders and investors used two typical models, fundamental analysis and technical analysis. It is important to note that these two types of analysis are the main forms of investing/trading in the stock market. Fundamental analysis involves someone understanding concepts like the health of a company via its competition, revenue and profit, it’s management, and potential for future growth (think Warren Buffet). The concept here is to understand a company is in a good position to grow and increase value. Once a company increases its value it pleases investors and professional traders. A trader or investor would have purchased the stock at a lower price and since the company has a higher value (higher priced stock) it makes a person money. Technical analysis does not include any of the above. Technical analysis strictly involves looking at a chart with a set of indicators and recognizing patterns. One random example would be if a certain company goes up during a certain time of year. If we assume that Apple will make more sales during the holiday season then we may be able to assume that its stock price will go up during that time of year. A professional trader that is looking at Apple stock might look for patterns in changes in price during a specific date or time of year. Technical analysis does not involve analyzing the company’s financials or management. It simply involves looking at a chart and making decisions. Professional day traders have advantages and disadvantages with both types of analysis but it also depends on what kind of trader a person is. If one is looking to invest in a company long-term we may look more at fundamental analysis. 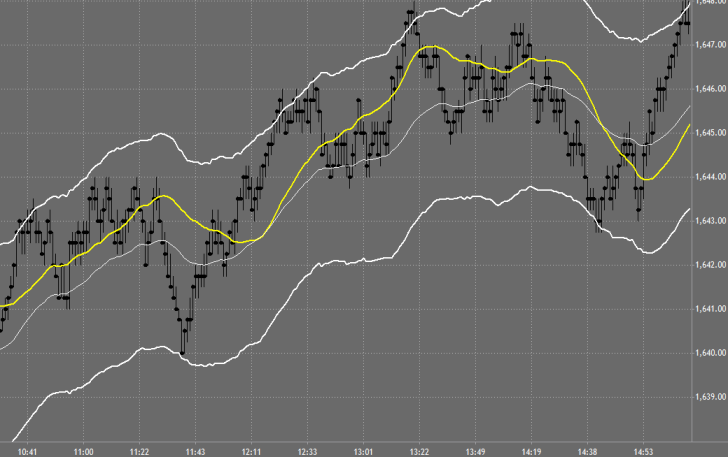 I prefer strictly a technical analysis approach due to the uncertain economic times we are in. I simply prefer to not have my money in the markets when something erratic or volatile can happen. It also takes a lot of work to look at news and connect the dots with all of the different opinions and news sources online. Instead I turn on my computer and begin looking at a chart, do a few minute pre market analysis, and begin trading. Most people that we call day traders look at the market which strictly technical analysis. They are normally classified into three different types of traders; scalpers, intraday traders, and swing traders. All three types of professional day traders are looking to do the same thing, make a profit based on a different in value. The only difference between the three is the amount of time they are involved in positions. Professional day traders that make money in the stock market with high frequency and lower profit are called scalpers. The goal is to take advantage of small inconsistencies in the market in addition to quick movements (changes in value in a matter of seconds or minutes). A scalper may only be in a position for five or 10 seconds or possibly a minute. A scalper also tends to place a higher frequency of trades and as their profit is normally lower per trade. 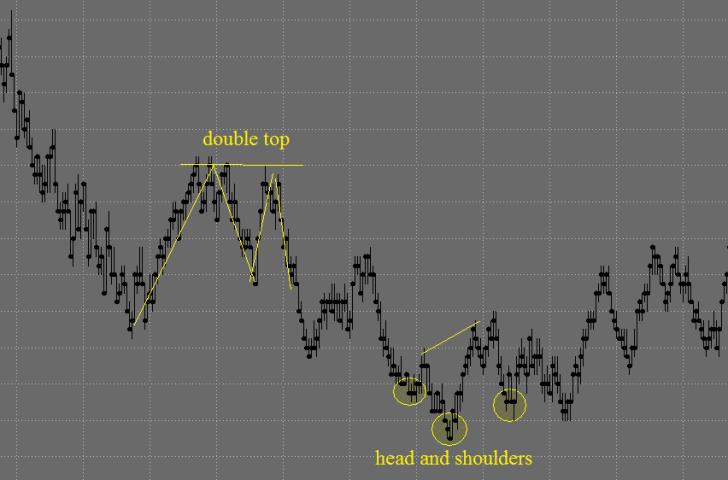 A higher frequency of positions (entering and exiting trades) is needed in order to make higher profits. Professional day traders that make money in the stock market on a daily basis are considered intraday traders. An intraday trader never holds a position overnight hence the term “intra-day”. Intraday traders are typically in positions from within a few minutes to possibly a few hours. Intraday traders are typically not as high frequency as scalpers but due trade more often than swing traders. I would consider myself an intraday trader as I normally trade between an hour or two a day with TheDayTradingAcademy.com. Most of our traders make their money within an hour or two a day. Our live classes are normally a few hours as well since the best activity in the markets come within the first few hours. Professional day traders that make their money swing trading involves a much longer period of time. A swing trader uses fundamental or technical analysis but stays in trades over a few days or even weeks. To compare the differences between a scalper or intraday trader, a swing trader may be in a position for a few days or weeks whereas an intraday trader never holds a position overnight. This swing trader term infers that someone plays the swings in the stock market rather than the quicker movements. 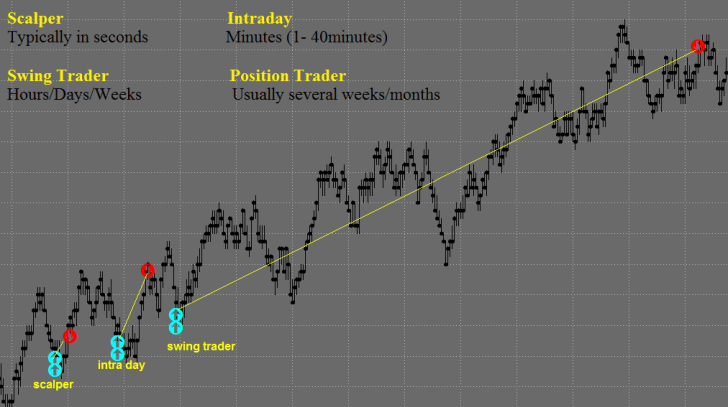 There are also much longer term day traders called position traders which hold trades for several weeks or even months. We won’t highlight these kinds of traders on today’s post. The whole basis of a professional trade day trader making money in the stock market involves accurately gauging the value of a stock. A stock of a company is in essence the price at which the general public says it’s worth. One of the most important things to understand is that a day trader can make money when the market goes up or down. If we are estimating the value on something we can also estimate that the value is going down and make a profit on it. Day traders can actually make more money when the market is going down, when the economy is in a recession, or when there is a crisis. One of the reasons I love to make a living day trading is because we actually make more money and an economic downturn and a crisis than we do when things are going well. I do still hope the best for you! So there you have it! A bit of novice background of how I make a living day trading & traveling around the world. The post How Professional Day Traders Make Money In The Stock Market appeared first on WanderingTrader.